Wisdom of Life. : WHAT is it that's hard to break??? The answer is: HABIT! If you break the H, you still have A BIT. If you break the A, you still have BIT. If you break the B, you still have IT! Hey, after you break the T in IT, there is still the 'I'. And that (I) is the root cause of all the problems. Isn’t it right?! 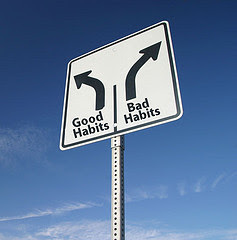 Now you know why HABIT is so hard to break…. Its destiny is in its name! As for me, it is so hard to break my habit not to write everynight coz i know you are there waiting to read my naughty blog. Thank you for coming back again. I love you.